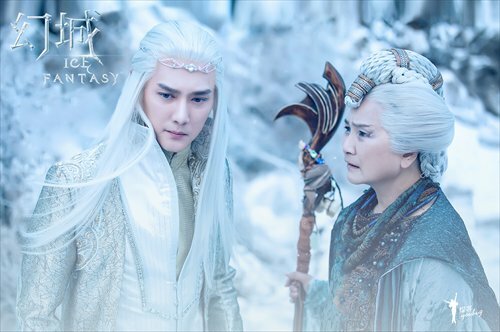 Considering the long white hair and pointy "elf ears," no one would blame you for thinking that Lee Pace's Thranduil from The Hobbit films had somehow become the main character of the new Chinese series Ice Fantasy. While the icy and snowy environment looks like something out of Game of Thrones. However, the Asian faces underneath all the Western-fantasy-style makeup are a reminder that this is made in China. Yet, with the strong resemblance to its Western counterparts, it's hard to see this series as anything more than a cheap Hollywood knock-off. Ice Fantasy is adapted from Chinese writer Guo Jingming's novel of the same name. Before its debut on Hunan TV and several streaming platforms on July 24, the show was getting quite a bit of buzz since Ice Fantasy was the novel that brought Guo, now one of China's highest earning writers, into the spotlight back in 2003. Guo, also the director behind the highly lucrative Tiny Times film franchise, is also directing the show. "We aim to create something like A Song of Ice and Fire," said Feng Shaofeng, the show's lead actor and also a producer, previously told media. This ambition has apparently been matched by an equally ambitious budget. According to marketing for the show, more than 360 million yuan ($54 million) was spent on the show's special effects, with the aim to bring the Chinese TV industry to a brand new level. However, audiences who have seen the show are wondering just where all that money went, as the special effects don't seem to be living up to the hype. 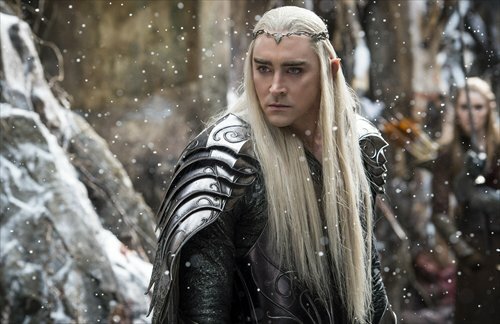 Besides the fact that the long white hair and crown on his head makes Feng's character look like a cheaper version of Thranduil, many of the show's mythical creatures have ended up looking cheaply made. The show's live action actors also don't seem to be very well integrated with the CGI backgrounds used in various scenes either. In a way the production has ended up looking more like a video game than a TV show. Cheap special effects are not the only criticism aimed at the show. Poor acting and lame storylines have also contributed to poor reviews from critics and audiences. Currently the show has one and a half stars out of five on Chinese media site Douban, with 76.8 percent of users giving it one star. "A rustic niche farce. Oriental faces playing Western fantasy characters. It's really stupid," reads one highly liked comment on Douban. Many users have commented that Ice Fantasy seems more like a cosplay show than a TV show. Despite the low ratings, the show does still have some fans, who feel that it's already a big improvement over most domestic TV series. According the promotional material for the show, Ice Fantasy brought in visual effects artist Jacques Stroweis, who was previously involved in Ghost Rider, as VFX supervisor. International visual effects companies Pixomondo and Primefocus were also involved in the post-production. Rising to fame while still in his teens, the now 33-year-old Guo is one of the richest writers and filmmakers in China. With his novels influencing an entire generation, he has become a role model for many young Chinese. However, he has also often been surrounded by controversy, as many claim that several of his more famous works had plagiarized others. Criticism of Guo has risen to a whole new level since he became a director. His Tiny Times series of films, which were adapted from his novels, were huge commercial hits, but were critically panned by reviewers. Ice Fantasy is not the first to be accused of being a cheap knock-off. Audiences pointed out that many CGI scenes in the hit 2015 Chinese TV series The Journey of Flowers also plagiarized Hollywood movies. Scenes featuring rivers, mountains and clouds were highly reminiscent of the film Maleficent, blood dripping on the ground covered by snow were similar to Snow White and the Huntsman and some caves looked like the homes of the Hobbits from The Hobbit. In recent years, Chinese TV and filmmakers have been working hard to bring their works to the level of Hollywood by bringing in visual effects studios and visual effects artists from overseas. But it seems that they still have a long way to go when it comes to quality and originality. Newspaper headline: A song of copy and paste?